If you haven’t heard yet, we have released Volume 5. – The Daydreamer – of Estila magazine. Or, bookazine, as we call it. I met Onome during one of the Cockpit Arts open days where one of her oversized artwork was displayed. I was drawn to her creative technique and the way she blends art with timeless fashion. When did you realise you have a passion for art? Art and design has always been a subject I enjoyed throughout my education. I graduated from London College of Communication with a BA Hons Degree in Film and Video. This led to a career in art direction and interior styling; assisting on shoots across a variety of mediums including Stills, Editorial and Film; building reputable work relations with international design magazines such as Wallpaper* and World of Interiors. Working on a project for a client and preparing a moodboard, I experimented with textiles and mixed materials to create figurative artworks. I liked the process and so continued to dedicate more time learning new handcraft techniques. I had my first exhibition in 2015 at Service Point Print Studio in Covent Garden. After much interest from visitors in purchasing my artwork, I was encouraged to apply for The Prince’s Trust Business Enterprise Programme to learn about running a business and explore my options as a self-employed artist. 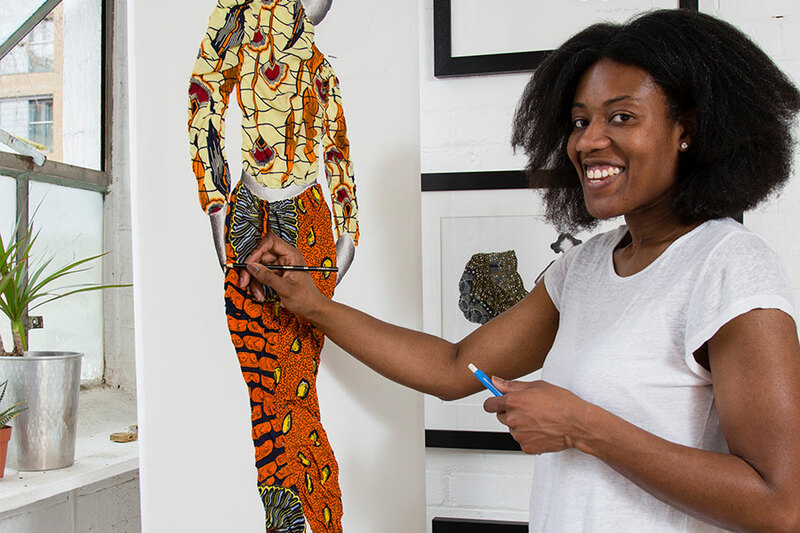 As a young creative I have participated in 7 group shows and 2 solo shows in Europe and Canada; and have won several awards, including the 2016 – 2018 Cockpit Arts Creative Careers Awards and the Evening Standard ‘Progress 1000’ Mentorship Programme 2017. I was recently selected as a finalist at the Evening Standard’s Young Progress Awards 2017, which included pitching ideas to a Dragons’ Den-style panel and live audience of 500 people. The opportunity has helped to improve my confidence and presentation skills, and has encouraged me to participate in public speaking and lecturing programmes at the Arts Society. I have built my profile exhibiting and selling in specialised art and craft markets in the UK. I have also reached an international audience through the Hotel Bloom! Art Residency in Brussels and exhibiting at the ‘Artist Project Contemporary Art Fair’ in Toronto, Canada (images from which have been used as promotional material for the Ted Talks – TedxEuston Conference in London). Inspired by world cultures, my style of work reflects textiles in relation to societies and customs; and to a further extent examines how costume is adopted and adapted by its Diaspora. 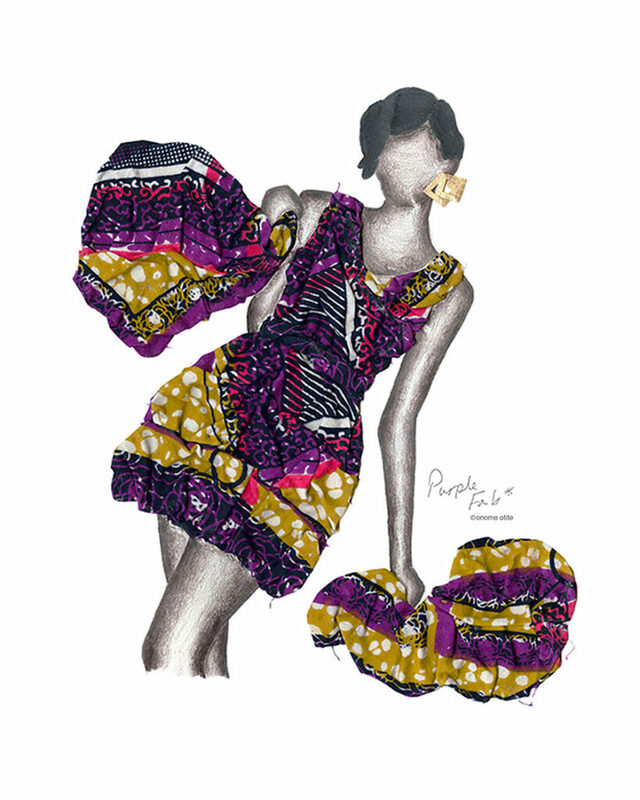 The use of wax print (colourful cotton cloth – that is hot waxed and dyed) pays homage to my Nigerian ancestry; and designs inspired by the traditional West African textiles I have encountered. Each figure reflects the many characters of the styled West African woman! You have a very unique way of creating your art? Can you describe the process? By applying handcraft practices, which include sculpting, moulding and stitching materials to decorate hand-drawn figures, I create the illusion of depth and movement. Craft methods and techniques are self-taught, for example I have learnt embroidery and sewing practices from books and social media. The forming of shapes is the organic part of my process and depends on the type of material being used. Harder materials produce a sculptural effect when moulded and so extensive research goes into sculpture and three-dimensional art. Softer materials, on the other hand, are malleable and easy to manipulate. I create folds and pleating details to suggest movement and flow. I sketch my ideas and designs beforehand and attend life-drawing classes to practice drawing the human form. To familiarise myself with the body in motion I have also attended dance performances. Finally all artworks are created from recycled materials and textiles, such as off-cut fabrics, old clothes and donated materials and makes use of textiles that would otherwise be put to waste. At the moment I outsource my patterned materials, however I plan to learn wax print techniques and create my own original designs. I explore dance in relation to textiles; how human beings occupy space while in motion and the shapes they create. I’ve looked into the relationship between costume and dance – in particular the movement of fabric whilst in motion and how costume influences the dancer’s routine. The inspiration behind this particular series is contemporary dance and performance art. 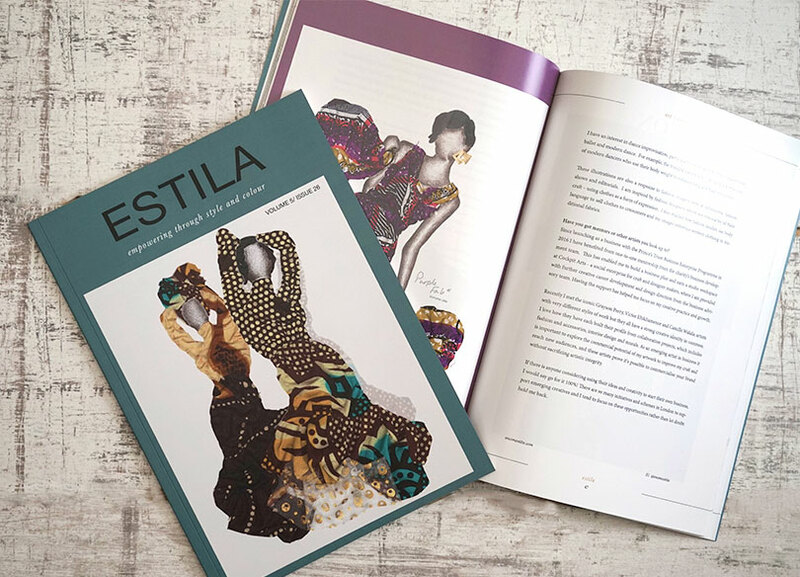 You can read the full feature in Estila Volume 5, which you can purchase here. Atelier of Success members get 20% discount. If you’re not a member, you can request to join our business club for creatives and designers here.